The Human Brain is the most interesting organ of the body. It is the hub for the human nervous system. It receives input from organs like sensory organs and sends output to other part of the body like muscles, for appropriate actions to be taken. That's not all. 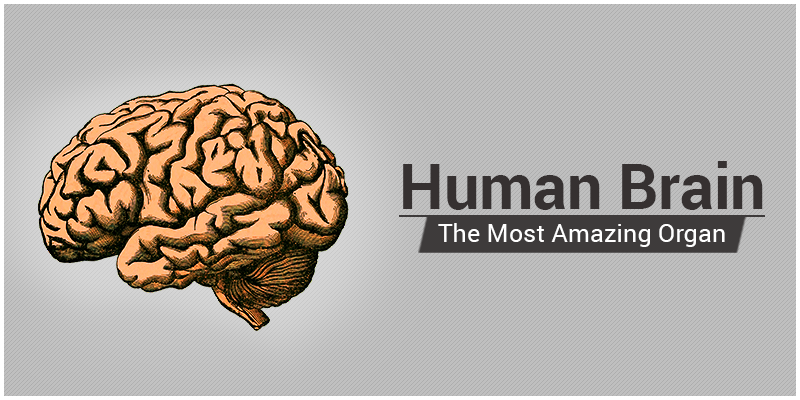 Human Brain has some amazing features and characteristics which will make your jaw-drop. We will discuss more about human brain but first let's explore this organ's whereabouts to know it better. 1. Brain consume more energy than other parts or organs of the body. The mind or the brain is the powerhouse which processes all mental and psychic activities, may be this is a probable reason why it consume more energy than any other part of the Body. The brain is only 2% on the total body weight but consumes about 20% of the energy. 2. Lack of oxygen in the brain for 5 to 10 minutes will result in permanent brain damage. After a cardiac or respiratory arrest, resuscitation, suffocation, prolonged seizure, drowning, choking, or (smoke) poisoning, if there is oxygen deficiency, then the brain may damage permanently. 3. Your Brain Keeps Developing Until your Late 40s. In other words, brain only fully 'matures' in middle age. 4. Every time you form a memory, a new brain connection is created inside your brain and is supported by patterns of neuron activity in the prefrontal cortex. Each neuron has the capability to connect with 40,000 synapses on an average. 5. Your brain mostly consists water. Yes, you read it right! 73% of human brain is water and 2% of dehydration is enough to affect the memory, attention and other cognitive skills. 6. The dry weight of the brain is around 3 pounds or 1.5 kilograms. You will be amazed to know that it is the fattiest organ of your body as it contains 60% fat (dry weight). 7. Human brain Contains about 100 billion neurons. Neurons also have the capability to connect more than 10,000 other neurons which implies that it can be a huge connection. Thee connection of neurons aids you to develop ideas, recall memories and develop a certain personality trait etc. Human brain is said to contain roughly 86 billion brain cells. For example, a student learn about Physics Formulas or Geometry Formulas, which will help him/her to understand the real-life problems throughout their life. 8. Human beings are said to the most intelligent animal in the world but it's astonishing to know that we use merely 10% or more of our brain. Though there are still other theories which states that this 10% theory is entirely bogus and human use way, way more than 10% or the brain power. 9. During pregnancy, the neurons in a foetus brain grow at a rate of 250,000 neurons per minute. Cells and neurons develops for several years after birth. A 2-year-old’s brain is said to of 80% of adult brain’s size. Not only in foetus, but also a pregnant lady's neurons multiplies at a faster rate. There are no proper explanations for this but scientists states that this rapid multiplication of neurons in a pregnant lady, makes learning new things and remembering old ones is much faster and easier than someone who isn't. 10.The human brain pumps a lot of blood per minute and is capable of pumping more. Your brain also uses 20% of the total oxygen present in your body. 11.Brain is vulnerable to a virus which can attack the human DNA and make them dull, less intelligent, cause harm to the brain activity, memory and learning power. 12.Human brain has tremendous capability. When awake, it can produce sufficient electricity to power a small light bulb. It produces 12-25 watts of electricity. 13. Cholesterol is a vital component for brain. Brain cells continue to live with the aid of cholesterol. 25% of the human body's cholesterol is present and used in the brain. Lack of cholesterol can lead to the death of brain cells as well. 14.There are almost 10,000 types of neurons present in the brain. Within which more than 1 lac chemical reactions takes place every second. 15.An average human brain is believed to sow the seeds of near about 50,000 thoughts each day and scientists estimate that 70% of these thoughts are negative. 16.Irrespective of the body size or weight, Men's brain size is 10% bigger than that of Women's. 17.Over the ages, the size of the human brains have shrink by the size of a tennis ball; IQ level has gone down by 1.6 points per decade; and the average attention span has dropped from 12 seconds to 8 seconds since 2000, but Human civilization is developing. Thus it would be inappropriate to state whether we are growing or declining in our development chart. We want to conclude with a small yet significant fact for you. Albert Einstein’s brain weighed 1,230 grams which is near about 10% smaller than the average human brain weight. But it was his brain's neuron density which was way higher than the average and this is what mattered in making him such a great and intelligent scientist. Author Bio - With a degree in Journalism, Mass Comm. and Human Rights, and with an experience of 5 years+ in the Online Media, Payel is a Content Analyst by Profession and Dreamer, Writer, and Blogger by choice. Currently a Content Marketing enthusiast as well and exploring all about the Education Industry with BYJU’s - The Learning App.